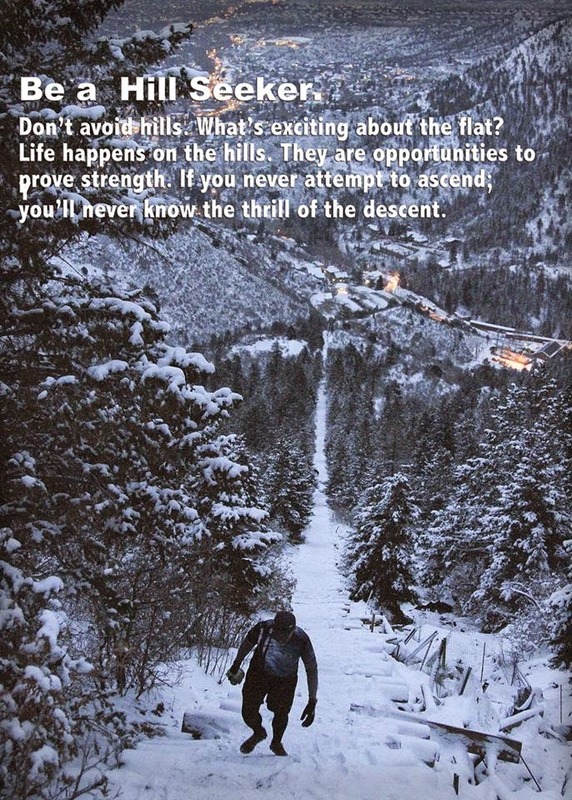 Ah yes... just about one year ago I made the leap into the world of ultra running and I haven't looked back. 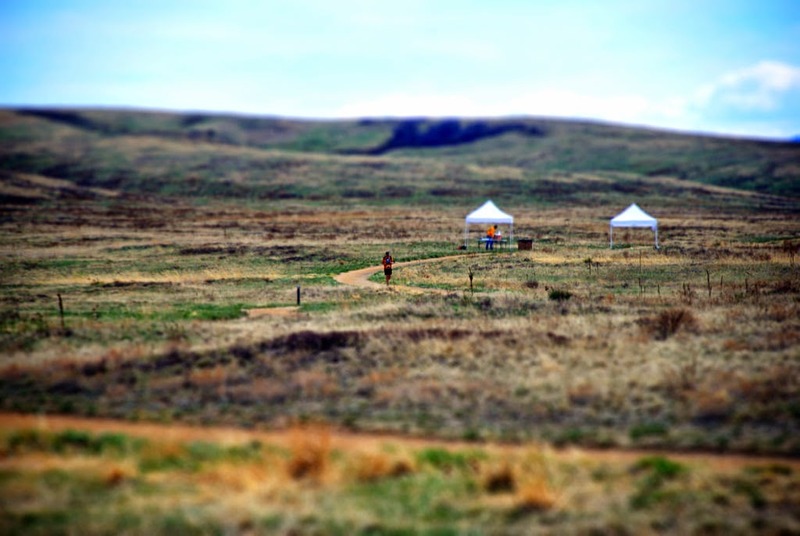 I am thoroughly hooked on trail running and ultra distances! I could hardly believe I ran an ultra last year, and now I can hardly believe a year has already gone by! 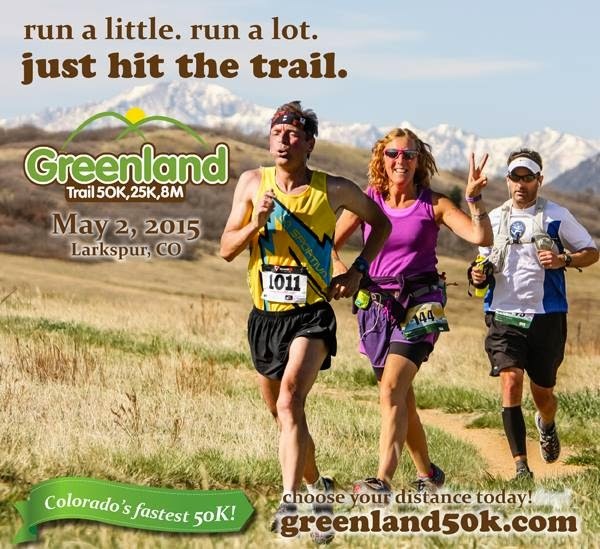 You can read up on my first experience at the Greenland Trail 50K by clicking HERE. So... I decided I wanted to run this one again... I want to know if I can improve, and to see what I've learned after a year has passed. During this last year I've also run two other 50K's (Tommyknockers, and Frozen Dead Guy), as well as a 50 miler (Bear Chase). Besides running those, I have also been fortunate enough to have some great coaching from Mark Lofquist and Human Potential Running Series. I've been working with Mark for the last 10 weeks, following a fully customized training plan specifically for this race, so I'm really looking forward to seeing how different this race is after being coached one on one with Mark. OK! 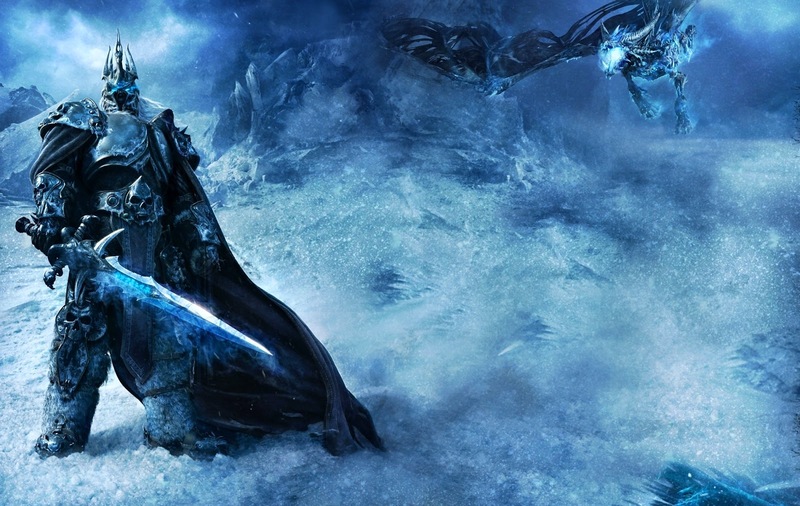 Here we are... the 3rd and final installment of the Winter Warrior series. Wait, winter you say? Yes.. I know it's Spring, but here in Colorado we are wishing/praying/begging for more snow... we need it to help offset the forest fire dangers of the summer, and we are way too dry right now... so do a snow dance for us! And if you get snow or cold, here's a review of more great gear for it... for now, or this coming winter! So....starting from head to toe, here's my final wrap up featuring the Petzl NAO headlamp, winter gloves from Pearl Izumi, Injinji 2.0 socks, and traction from the Hillsound Freestep 6! 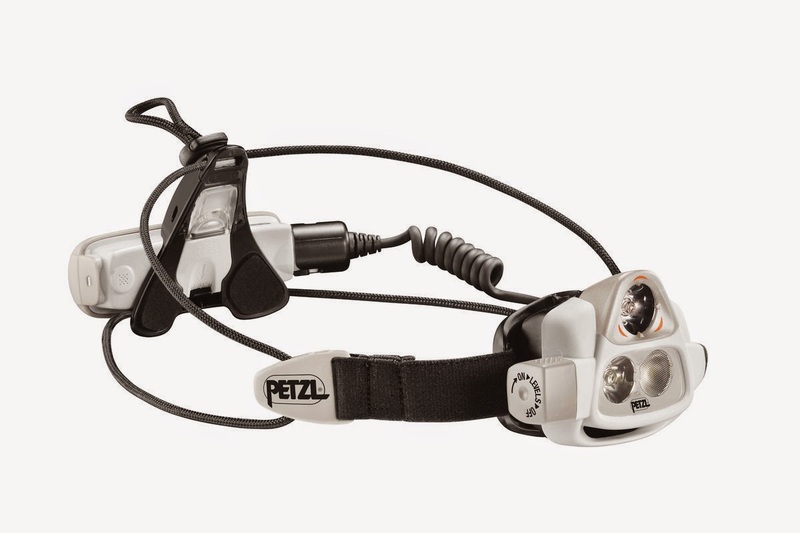 First up... the Petzl NAO headlamp. I first saw the NAO while working an aid station at the Indian Creek 50's last fall. A friend working the aid station had it on as we were lugging gear up the trail in the pre-dawn darkness. I was blown away by light this thing was throwing out, especially when looking off into the distance.. I of course had to check this out for myself! So, winter running means running in the dark quite a bit... especially for me. And I like to see where I'm going, and also see who (or what) else may be out there with me! The coolest feature of the NAO is the reactive lighting system. The sensor up top gathers the amount of light being reflected back, and adjusts the output accordingly. So, if you are running a snow packed single-track and looking a few feet ahead, you get enough light to see very well. But if you hear something off in the woods, or you want to look up and ahead a bit to see what's out there, the reactive lighting kicks the headlamp into turbo mode and creates a daylight like beam of light... amazing. Ok... so what is that range of light output? Anywhere from 7 to a whopping 575 lumens! So, I know.. your next question is... how fast will that burn up the USB rechargeable battery? If you go with the "Max Autonomy" setting.. meaning let the NAO run most efficiently... the range is 7 to 290 lumens and will run around a 12+ hour burn time...with a 52 hour max. If you want full power up to the 575 lumens, that time is reduced to 6 1/2 hours.. still pretty amazing. AND.. you can buy an additional battery pack to carry to extend that run time. The battery pack disconnects easily from the headlamp, and is quick to recharge. Comfort wise, I like the design of the head strap. Once you dial in the adjustments, it fits well, and comfortably, with little or no bounce. The controls are easy to use, and I didn't find it to feel extra heavy or anything. The battery pack on the back kind of balances against the headlamp up front. Once in awhile I did bump the battery on the bottle in my Orange Mud Single Barrel Hydraquiver.. but only if I looked up high... 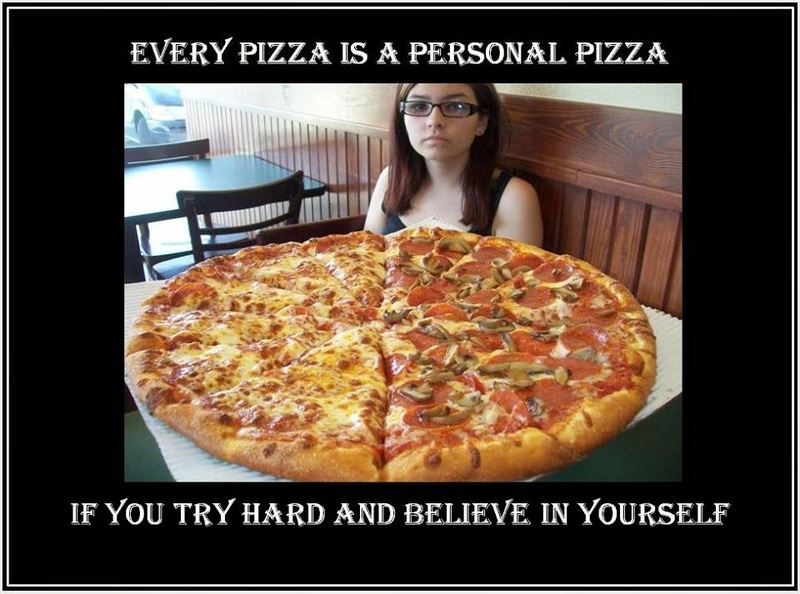 I don't have this problem with the Double or VP2. 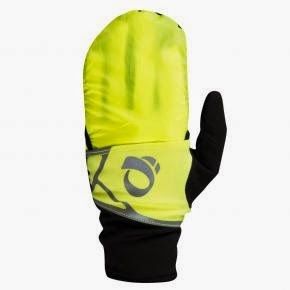 Ok, if you remember back a few years, I did my first Winter Warrior feature that included Pearl Izumi cold weather gear.. this go around, I got to try out two of the latest winter/cold weather gloves. 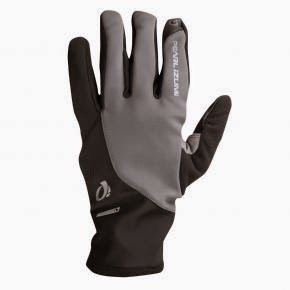 For this review, I spent a lot of this winter running in the latest Select Soft Shell glove, and the Shine Wind Mitt. Much like the version I tested two years ago, the Select Soft Shell glove is a terrific winter running glove. The soft fleece interior, combined with 3 layers of wind/water resistant materials make these comfortable and warm. Also, I do appreciate that the thumb and forefinger are conductive, and work fairly well with the touch screen on my iPhone. The temp rating on these is 0-40F, but as I mentioned, I have wimpy hands. I ran in these down in to the teens, but at those temps I wasn't super comfortable. 20F and above, no problem... and sometimes maybe a bit warm. The only struggle I have with these (and most gloves) is getting them back on if my hands are really cold, or the opposite, when they are a bit warm and sweaty. One terrific plus about the Select Soft Shell glove, is that they also work as awesome winter driving gloves! The textured grippy pattern on the palms and fingers provide a great grip on a frozen steering wheel! For a light-weight comfortable cold weather glove, these are hard to beat. Now... for milder cool weather conditions, the Shine Wind Mitt gloves are really terrific. First off I love the bright neon yellow... I know I stand out a bit more when I have to run by the road. Also, these gloves are super light, super thin, and super comfortable! The cool feature is the "mitt" which stores in the back of the glove, but can be pulled out and over the fingers to provide a windshield and a mitten like cover. Oh.. and these have the conductive fore finger and thumb as well. I was surprised at how this thin layer really made a difference, especially when running into the wind. Ok.. from head, to hands.. now to feet!! If you've been following for a while, you know how much I love Injinji toe socks! They are really the only sock I run in, and I wear them pretty much all the time. For winter running, the Performance 2.0 Outdoor models are really tough beat! This winter I've been running in the Mid-Weight Mini-Crew (left) and the Original Weight Crew (right). Both have been terrific runners this winter. Each weight is crafted with 65% NuWool merino wool, 33% nylon, and 3% lycra. After running in these, I've found that I really like the Mid-Weight version for the warmth, and for just that little bit of extra padding for the long haul. But don't get me wrong, the original weight is quite warm still, only with a lighter feel and slightly less cushion. I think for true winter running, the ideal combination (for me at least) would be the Mid-Weight, but in the Crew length. I normally like a low cut sock, but for winter running, having the over the calf coverage is nice, especially when pairing with running tights I can pull down over the sock. This eliminates any gaps, and keeps the snow out as well! I can't say enough about Injinji... I may have to purse being an Ambassador, I love their products so much and always end up going on and on about them.. like now! Last but not least, winter running requires traction! Normally, I run in YakTrax, and usually the YakTrax Pro. And, I even experimented with sheet metal screws in my shoes for ice traction (more on that in a later post). However I do know a lot of folks that run with spikes, much like the FreeSteps 6's from Hillsound that I had a go with this winter. The FreeStep6's are a pretty heavy duty running spike/crampon. The spikes themselves however don't stick way out like some other's I've seen. The stainless steel spikes stick out enough to get really good traction, but not so much that they become uncomfortable on hard surfaces etc. Also the elastomer harness remains stretchy in the cold, but still holds well to your shoe when running. While the traction from the FreeStep6's was superb, I really struggled using these with my shoes, and in particular, with my more minimalist foot wear. The problem? The two links at the toe that connect to the cross over band had a tendency to dig into my toes. This was a bummer, because I loved the confidence I got from the traction, but the pressure became painful However, I am testing out some Hoka Huaka's, and they seemed to have enough protection around the toe, that I was able to run with the FreeStep6's a bit better in them, without feeling that painful pressure. Using these with sturdy hiking boots or heavier trail shoes should not be a problem, however in something minimalist and less sturdy, this could be an issue. But, that issue aside, I can certainly see the appeal of spikes/crampons for the ultimate in traction. Well OK! That wraps up the Winter Warrior 2015 series.. thanks again for tuning in. I hope these reviews are helpful! I am also happy to say that as I am typing this, it is snowing out.. and has been all day... could get 9+ inches tonight! That is so awesome because we truly need Spring snow to keep away Summer fires! Good night and happy trails!